As its name implies, the cytoskeleton helps to maintain cell shape. But the primary importance of the cytoskeleton is in cell motility. The internal movement of cell organelles, as well as cell locomotion and muscle fiber contraction could not take place without the cytoskeleton. The cytoskeleton is an organized network of three primary protein filaments: microtubules, actin filaments, and intermediate fibers. 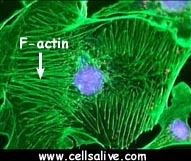 The complexity of the cytoskeleton can be seen in the abundant F-actin stress fibers (green) in the endothelial cell shown above.